If there was ever a name that did not suit a horse it would have to be Halo, for he was no angel. His legendary temper was described as nasty, violent, dangerous and even psychotic. My friends at Windfields Farm would tell me horrifying stories of what their fellow grooms and handlers had to endure while having to attend to the stallion. Halo needed to wear a specially designed muzzle to keep him from biting anyone he could get near. The muzzle could not stop him from attacking humans and other equines however as he was also very clever and could devise new methods to exert his viciousness. Throughout the course of history in the Thoroughbred breed, there have always been evil tempered stallions and Halo might not have been the worst. Legendary stallions such as Eclipse, Stockwell, Hastings and Sir Tristram were noted as being very dangerous. This trait is often seen as a stallion that posses a very strong will, which breeders and owners look for in their charges. Perhaps not as over the top as Halo, but feisty and aggressive, would be more in keeping for most. Halo is not the last of the “dangerous” stallions by any means, but he certainly ranks with some of the all time scariest. 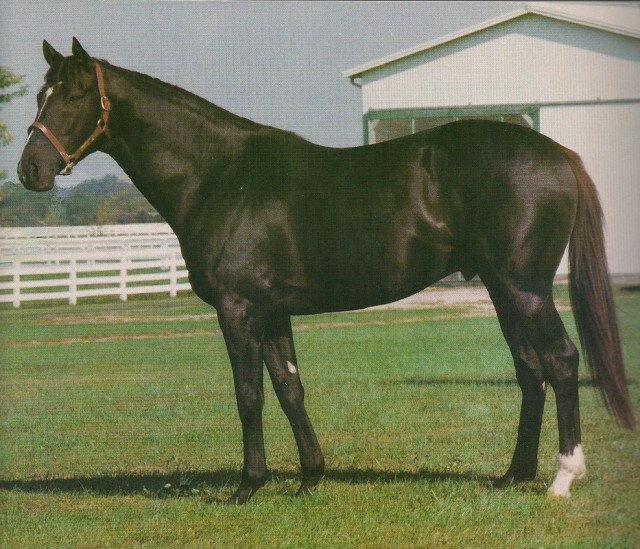 Halo was however a very successful sire and even though he was scary to be around, his value as a sire would increase each year of his stud service life due to the racing accomplishments of his progeny. To look at Halo one would say he is a beautiful horse, which he is on the outside. Looks can be deceiving. He was a 16.0 hands dark bay almost black with a white blaze and one white foot. He was not typical of most of the Hail To Reason offspring. He was a more refined but powerful horse, as opposed to the coarse stockier get associated with his sire. Halo was not the best of his generation on the track but he was very fast and won some big races such as the Lawrence Realization Stakes, the Tidal Handicap and the United Nations Handicap. He possessed a strong pedigree being by Hail to Reason – Cosmah by Cosmic Bomb. Cosmah was a daughter of the great broodmare Almamoud. Halo was purchased by leading owner Charles Engelhard for $100,000 as a yearling in 1970. He was given to top trainer Mackenzie Miller, who took his time with Halo as a two year old. Sadly, Engelhard passed away before Halo began his racing career. The black colt made his race début on October 13 under the banner of Craigwood Estate at Belmont. He won by two and one half lengths after breaking slowly from the gate in the five and one half furlong race. He made one more start at two, finishing fourth on a sloppy track. After a winter holiday on Miller’s farm in South Carolina, Halo began his three year old campaign at Keeneland with a winning appearance in a six furlong allowance race, on a sloppy track. He followed this by winning a seven furlong allowance at the same meet. Shipped to Belmont, Halo faced a good field in a one mile allowance. He made it three wins in a row with his victory over the very good grey Ruritania. Halo made his stakes début finishing a respectable third in the Jersey Derby, but then went unplaced in the Saranac Stakes. Later that year he was second in the Lamplighter Handicap, third in the Dwyer Handicap and third in the Jim Dandy Stakes. He often raced against very classy horses such as Tentam, Droll Role, King’s Bishop, True Knight and Ruritania. After a second place finish in a one and one-quarter mile grass race, Halo captured his first stakes win in the twelve furlong Lawrence Realization Stakes. He finished unplaced in his final four races as a three year old. His four year old campaign would be hampered by various setbacks, resulting in Halo making only five starts without gaining a victory. However he did finish second three times, beaten by the likes of Prove Out and Riva Ridge. Halo was sold for $600,000 at the end of the year to Irving Allen, owner of Derisley Wood Stud in Newmarket for a new career as a breeding stallion. However a problem emerged with this transaction. Allen was to learn that his new stallion prospect was a cribber, a horse trait frowned upon by many in the industry. Irving Allen refused to accept Halo to his stud. Allen initiated a law suit against Tom Gentry, who had brokered the deal, and the Craigwood Estate representing the recently deceased Engelhard’s family. There was a counter-suit by Gentry and Craigwood. Halo would be sequestered at Gentry’s farm while the litigation process took place. He was “penned up” for a considerable length of time. The case was settled months later and Halo was returned to Mack Miller in March of 1973. When Halo came back to Miller’s barn, a noticeable change in the horse was obvious. Halo had always been a skittish colt. After the confinement time he had endured, the now five year old had become far more aggressive and much tougher to handle. Miller and his team would meet the challenges Halo presented and get him back to the races by June. Halo finished second and then third in his first two races, both allowance races on the dirt. Miller then entered him in a one and one-sixteenth mile allowance grass race where he pulverised the opposition by an easy six lengths. He then captured the nine and one-half furlong grade two Tidal Handicap a mere five days later. Miller took note that Halo had matured physically and had a definitely new masculinity about him. Halo ran unplaced in the Suburban Handicap finishing fourth to True Knight and Forego, and was then purchased from Craigwood by Windfields Farm for $1 million. His first race under the turquoise and gold silks of his new owners was in the Bernard Baruch Handicap at Saratoga, finishing second. Then came his best race. The United Nations Handicap at Atlantic City was a nine and one-half furlong grade one grass race which has attracted some very fine horses. Windfields’ very own Tentam had won the race the previous year. Halo would defend the race for the stable beating the very capable grade one winner London Company by a length. A few days after this solid victory Miller had to report to Windfields that the emerging grass specialist had bowed a tendon. He was retired there and then to Windfields’ Maryland Farm for stud duty. From his first crop of foals came the great mare Glorious Song. Glorious Song became the Canadian Champion mare in 1980 and 1981 as well as the Champion mare in the U.S. in 1980 and Canadian Horse of the year in 1980. Glorious Song later became a glorious broodmare as she is the dam of world travelling grade/group one stakes winner Singspiel (Canadian International, Coronation Cup, Juddmonte International, Japan Cup, and Dubai World Cup) and of the graded stakes winner Rahy. Both Singspeil and Rahy have become influential sires of world class stakes winners. Misty Gallore, another filly from Halo’s first crop, won the Barbara Fritchie Handicap, the Bed O’ Roses Handicap and the Distaff Handicap among her eleven wins in her racing career. She also became a good broodmare producing Silver Ghost by Mr. Prospector, one of the first sons of that great sire to stand at stud. Silver Ghost got 8% stakes winners from foals. Rainbow Connection was the Canadian champion two year old filly in 1980 after winning the Natalma Stakes, the Demoiselle Stakes and the Princess Elizabeth Stakes. She followed up as a divisional champion as a three year old filly in Canada with wins in the Bison City and Wonder Where Stakes and a bang up second place finish in the Canadian International. Rainbow Connection continued the excellence of Halo’s daughters as broodmares producing multi Canadian champion Rainbows For Life by Lyphard, and graded stakes winner Always a Rainbow by Mr. Prospector. Tilt My Halo out of the great broodmare of the year Loudrangle by Quadrangle, became another Canadian three year old filly champion. Bred by Ernie Samuel, owner of Sam-Son Farms, she won the Canadian Oaks, the Selene Stakes and the Fury Stakes during her championship season. She finished her career with seven wins from ten starts. Goodbye Halo won seven grade one races including the Kentucky Oaks, Mother Goose Stakes, Demoiselle Stakes, CCA Oaks and the La Canada Stakes among her eleven career victories. Staying with the daughters of Halo, Rowdy Angel was not a winner on the track but was a big winner as a broodmare, producing Demons Begone by Elocutionist and Pine Bluff by Danzig. Coup De Folie, winner of the Prix de St. Cyr would also excel as a broodmare. She is from the family of Northern Dancer as she is out of Raise the Standard, a daughter of Natalma. Raise the Standard was sired by Hoist the Flag. Coup De Folie is the dam of Exit to Nowhere (Prix Jacques Marois) and the very influential leading sire Machiavellian by Mr. Prospector. More daughters of Halo to excel as broodmares include Valse Musette, the dam of Basqueian (Queen’s Plate) by Bounding Basque, Halory produced Van Nistelrooy (Futurity Stakes, leading sire in Argentina) by Storm Cat, and Indian Halo was the dam of Indian Ocean (Affirmed Handicap) by Stormy Atlantic. Halo for the first part of his sire career was noted for his good daughters. In 1983 a big chestnut colt from Canada would change the perception of his detractors’ opinion toward his sons. Sunny’s Halo became his sire’s first Kentucky Derby winner. Bred and owned by David “Pud” Foster, Sunny’s Halo was out of Mostly Sunny by Sunny, a son of Princequillo. Sunny’s Halo was born at Windfields Farm in Oshawa, Ontario as his dam was boarded there by Foster. Sunny’s Halo was the champion two year old in Canada notching wins in the Colin, Swynford, and Grey Stakes. He later added the Coronation Futurity, the top race in Canada for two year olds. Sunny’s Halo sustained stress fractures in his shins around this time. His trainer David Cross would utilise a then revolutionary swimming therapy. To help keep him fit and to ease the inherent ankle soreness that developed, a special indoor pool designed for horses was used for Sunny’s swimming regimen. By late March of his three year old season, Sunny’s Halo was ready to start his journey to Kentucky. He won the Rebel Handicap and the Arkansas Derby en route to his Kentucky Derby victory. His form would dip after this but he did recover to win the Super Derby at Louisiana Downs, his final victory. Sunny’s Halo was syndicated for $7.5 million and sent to Domino Stud in Lexington. He was eventually sent to Double S Thoroughbred Farm in Bullard Texas where he finished his career as a sire. Sunny’s Halo died in 2003 and his remains are now in the Kentucky Derby Museum at Churchill Downs. Devil’s Bag was retired due to his injury and stood his entire career as a stallion at Claiborne Farm in Kentucky. Among his forty stakes winners were Twilight Agenda (Meadowland Cup, Bel Air Handicap etc), Buy the Sport (Gazelle Handicap), Devil His Due (Suburban Handicap twice, Brooklyn Handicap, Pimlico Special etc), and Taiki Shuffle (1998 Japanese horse of the year). Lively One was a multi stakes winning son of Halo. The grade one Swaps Stakes would be his most prestigious victory, in a career that earned $1.5 million. Southern Halo was only stakes placed but as a stallion he became one of the all time greatest sires in Argentine history. He led the sire list eleven times in Argentina. Southern Halo sired one hundred and seventy stakes winners, there and in North America after he was repatriated and utilised as a shuttle stallion. Among his get are More Than Ready (Sanford Stakes, King’s Bishop Stakes etc) who is a successful active sire at time of writing, Miss Linda (Argentine Oaks, Spinster Stakes etc), and Canadian champion two year old Edenwold (Queen’s Plate, Colin Stakes etc). Saint Ballado, another full brother to Glorious Song and Devil’s Bag, became the most accomplished son of Halo to stand a full career at stud in North America. His career was not long however, as he lived to be only thirteen years old. He began his career at Ocala Stud in Florida for the modest fee of $2,500. He became the leading sire in 2005 (posthumously) with progeny earnings of $9.2 million that year. His final stud fee was $125,000. Saint Ballado sired grade one winners such as Captain Bodgit (Florida Derby), Sister Act (Hempstead Handicap), Yankee Victor (Metropolitan Handicap), and Sunriver (Hollywood Turf Cup). Saint Ballado also sired two champions in 2005. Ashado won seven grade one races including the Spinaway Stakes, the Kentucky Oaks, the CCA Oaks, Breeder’s Cup Distaff, Go For Wand Handicap and the Beldame Stakes. She also earned an Eclipse award for champion three year old in 2004 and for champion older mare in 2005. Saint Liam won four grade one races in 2005 including the Breeder’s Cup Classic, Woodward Stakes, Stephen Foster Handicap and the Donn Handicap on his way to Eclipse Horse of the Year honours. At stud he sired the great race mare Havre De Grace, the 2011 Eclipse Award Horse of The Year. Halo’s best son has unquestionably been Sunday Silence. Sunday Silence was very much in his sire’s image, both in appearance and in personality. He was known to be an aggressive belligerent horse during training and especially as a stallion. His accomplishments on the track however far exceeded that of Halo. Sunday Silence won the Kentucky Derby and the Preakness Stakes defeating his arch rival Easy Goer both times. Easy Goer would exact his revenge in the Belmont Stakes, thus denying Sunday Silence triple crown glory. The two met in the season ending Breeder’s Cup Classic with Sunday Silence taking the win in exciting fashion and securing Eclipse Horse of the Year honours. American breeders were not keen to breed to the champion when he entered stud at Stone Farm in Kentucky. Sunday Silence was subsequently sold to Shadai Stallion Station in Hokkaido Japan. Here the son of Halo has founded a dynasty of world-wide importance. Sunday Silence led the Japanese sire list an incredible thirteen times, siring one hundred and seventy-two stakes winners. Furthermore he has become a sire of sires with leading sire sons Agnes Tachyon, Manhattan Cafe, Hat Trick, Silent Name and the brilliant Deep Impact all having won sire titles in top racing jurisdictions around the globe. Deep Impact is currently one of the top five stallions on the planet today. Halo was not a sire of many greats on the track but when they were good, they were very good. Glorious Song, Sunday Silence, Devil’s Bag, Tilt My Halo, Rainbow Connection and Sunny’s Halo were all champions while Southern Halo, Saint Ballado, Coup De Folie as well as Glorious Song and Sunday Silence have furthered his name in future pedigrees of champions around the world. In 1986, Windfields Farm sold Halo and the stallion was relocated to Arthur Hancock III’s Stone Farm in Kentucky and would live the rest of life there. He was pensioned from stud duty in 1997 at the age of twenty-eight and lived to the ripe old age of thirty-one. He never mellowed as he got older, remaining a handful for even the most talented stallion handlers. Even though Halo was not a horse one could love, one cannot deny that he was a significant contributor to future champions. Halo will be remembered as the Ty Cobb of Thoroughbred breeding. REALLY appreciated reading this well written account of Halo and his prodigy. Most of this information I did not know and found VERY interesting. Thanks for making it so readable and understandable!